Two fixed shelves, with 4 adjustable dividers. Plate-mounted 4" diameter hard rubber casters (two free/two locking). 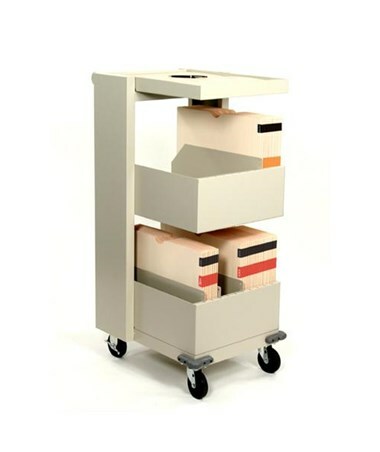 The Datum X-Ray Cart™ is the sturdiest on the market, and is designed specifically for smooth, easy, and quiet transport and storage of X-ray file jackets. Offering a generous 34 lineal filing inches (LFI), the Datum X-Ray Cart features two fixed shelves, a convenient work surface on top, and 4 adjustable dividers, for high capacity and maximum flexibility. 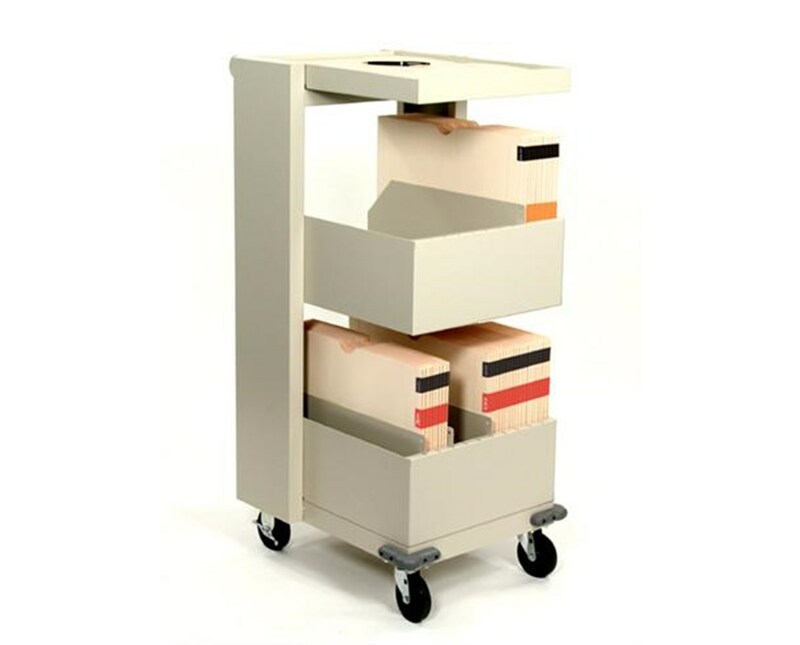 This cart is designed for quiet operation - the plate-mounted, 4" hard rubber casters (two locking swivel/two non-locking fixed) eliminate that annoying rattle, and the solid construction eliminates the squeakiness often found in other carts - meaning no noise and distraction for your medical office staff every time the file cart goes by. The push handle allows for easy maneuverability, while the rubber bumpers protect furniture and doorways. Quiet 4" diameter hard-rubber casters roll easily over indoor surfaces and doorways. 34 lineal filing inches (LFI). Plate-mounted, 4" hard rubber casters (two locking swivel/two non-locking fixed).